My daughter who specializes in getting comfortable likes across a Serving Tray that she brought out so that she could lay on it to watch morning cartoons. Great pose, I like the lighting, good colors. Very funny, I see my kids do stuff like this all the time! If this was a candid - great shot. If set up how did you get her to keep still long enough? I think this is such a lovely picture. I love the way her little feet are spread out to the side and the hair is draping over the seat. Such a natural shot. Hey the Tweenies! 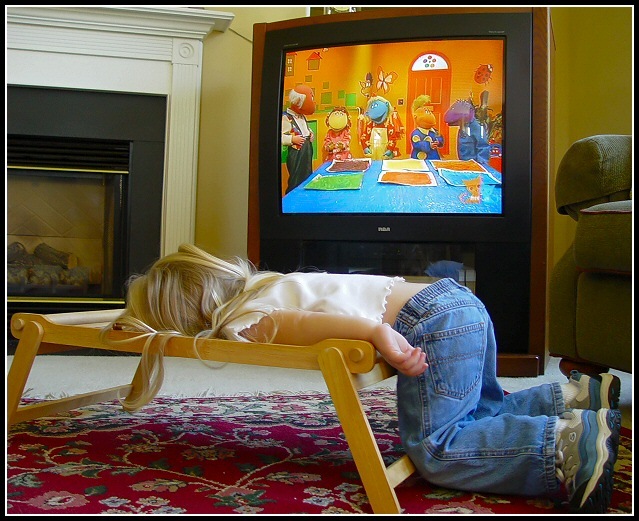 :-) (My daughter watches that too) cute pose, doesn't look very comfortable though...does she really watch t.v. that way?? Also there is a little bit of a glare coming off of the tv. I love this one. Bet she didn't even notice that you were taking her picture. Good job of capturing the moment. Well done. cute picture, and good capture with the TV on. Is the girl really sleeping? I like the 'soft' composition... provokes a very calm feeling. Now this is a fabulous 'real to life' photo! Great color and clarity...very crisp and vivid...it just pops right out at you...makes me feel that I'm right there...wonderfully done....I give it a 10!!!! This is so cute! The colors and lighting is wonderful good job! Proudly hosted by Sargasso Networks. Current Server Time: 04/19/2019 08:19:34 AM EDT.